Shabkadr is an outpost of Peshawar on the North-West Frontier. It was a fort built by the Sikhs on a mound with walls fifty feet high, almost impregnable to a force without artillery. A local chief, Mohammad Khan had gathered an army near the fort and two actions had been fought by the time two troops of the 7th arrived with reinforcements (5 officers and 140 men) bringing the total number of men in the fort to 48 officers and 1752 other ranks). The rebel force had 5600 men. When these tribesmen formed up on high ground in front of the fort, Colonel McDonald, the fort commander took the troops out to meet them. The Rifle Brigade and Gurkhas were in the centre and the 7th on the left with the task of drawing the enemy skirmishers forward. This they did and folded their right wing into the centre to be bombarded by the Horse Artillery. The 7th charged three times and the enemy were driven back and routed. 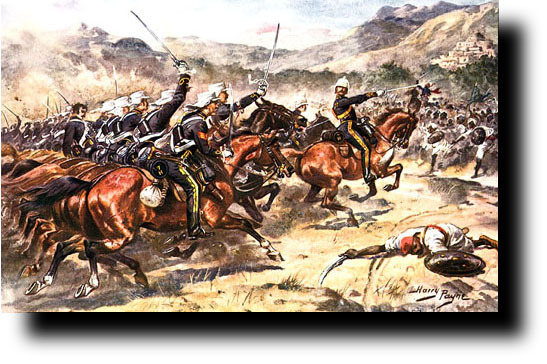 The British losses were light, 2 killed and seventeen wounded, 9 of which were from the 7th Hussars.